What a return to the Premier League we had last weekend - the table tightening at the top and in the race for survival. The drama looks set to continue this weekend and we have some fascinating games as the pressure ramps up for you live on Sky Sports. We get underway with Fulham hosting Manchester United in the early kick-off on Saturday. The visitors' fine form under caretaker manager Ole Gunnar Solskjaer continues - they remain unbeaten with seven wins from eight Premier League games. United were 11 points behind the top four when Solskjaer was appointed - a gap that now stands at just two points ahead of the weekend. United's total of 22 points from the Norwegian's opening eight games in charge represents the best-ever start by a new manager at a Premier League club. 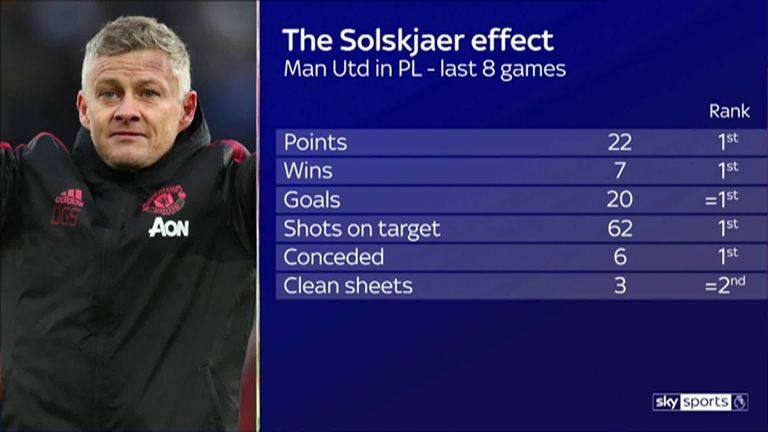 At the end of the last round of fixtures, United had scored the joint-most goals with 20 during that period, while their three clean sheets under Solskjaer is more than they managed in 17 games under Jose Mourinho this campaign. There is no disguising Fulham's primary problem: they go into the weekend with the worst defensive record in the Premier League - conceding 55 goals in their 25 games. That total is the most goals shipped by any top-flight team at this stage of a season since Fulham themselves conceded 55 goals, en route to relegation in 2013/14. They are just the fifth team in Premier League history to concede at least 55 goals after 25 games, and it does not look good for Fulham - the previous four were all relegated. In this season of struggles, they have also kept a league-low two clean sheets - their only shut-out at home coming against rock-bottom Huddersfield in December. What a return to Tottenham it has been for Heung-Min Son, whose crucial late goals against Watford and Newcastle secured dramatic, late wins in their last two games - while Spurs remain without the injured Dele Alli and Harry Kane. Those goals mean Son is now into double figures for the third successive season in the Premier League. Since November 24 to the end of matchweek 25, no other player has been directly involved in more goals - despite spending three weeks away at the Asian Cup with South Korea. Tottenham's man of the moment scored a stunning goal in the reverse fixture at the King Power Stadium back in December and he also has three goals in three league starts against the Foxes. Manchester City were in sparkling form as they beat Arsenal at the Etihad Stadium last Sunday to make it seven wins in their last eight home games against 'big six' opponents. It comes as no surprise that Pep Guardiola's side have the best home record in the division this term - with the most points, wins and goals. Last season's encounter saw Bernando Silva score the matchwinner, while Chelsea were criticised heavily for their approach - failing to have a single shot in the first half or a single shot on target in the entire 90 minutes. If Chelsea are to leave the Etihad with reward and maintain their place in the top four, then Eden Hazard is likely to play a key role. The Belgian scored twice in their 5-0 win against Huddersfield last Saturday. Those two goals saw him become the first player in the Premier League this season to reach double figures for both goals and assists. It is the first time in seven seasons at the club that Hazard has achieved this feat, and his 22 goal involvements for the season is just one shy of his best ever top-flight return of 23 in 2014/15. Hazard also has a good record in this fixture, scoring three goals in his last five appearances against City - including in a 3-1 win at the Etihad in December 2016. So we get underway on Saturday lunchtime at Craven Cottage, with Manchester United looking for their fifth successive away win in the league under Ole Gunnar Solskjaer, with coverage begins at 11:30am. On Sunday, we start at Wembley where Tottenham will look to keep in touch with the top two as they take on Leicester, in a game that finished 5-4 last season - then the focus is on the Etihad as Manchester City face Chelsea from 3.30pm.